Well, things finally cooled down enough that I could have a little leisure time. Summer is a busy time for us radio folk, with a multitude of festivals and events to go cover, and small market is no different. Luckily, while things were busy in June, it appears as though, this year, things peaked on Canada Day, and now July is relatively quiet, until the fairs of August. So when I was done covering all the various Canada Day celebrations, I finally had a chance to run into the city and see Incredibles 2. At the start of this decade, when Pixar started cranking out sequels to their hits, #1 at the top of everyone's wish list was Incredibles 2. Yeah, Finding Dory was nice and Cars 3 was certainly a movie, but we all wanted to see the further adventures of the Parr family. Well, it was kind of tough, as writer/director Brad Bird wandered off to try his hand at live action, giving us Mission: Impossible - Ghost Protocol and Tomorrowland. But once that was out of his system, he went, "Ya know, I think I finally have an idea for Incredibles 2." And here we are. Picking up immediately where the first film left off, Incredibles 2 opens with our heroes...being detained, because, in this universe, being a superhero is still illegal. On top of that, the government agency that used to relocate them after such outbursts has been shut down, so they're on their own. But then, enter the billionaire industrialist twins Winston and Evelyn Deavor. They're big superhero fans, and want to launch a PR campaign to start lobbying the government to legalize superheroes. Their plan: send Elastigirl back into action to show what good she can do in the world. Mr. Incredible, who doesn't get to go back into the field just yet because the numbers show he causes way too much collateral damage, becomes a stay-at-home dad to look after the kids. So while Elastigirl does battle with a new super-villain called the Screenslaver, Mr. Incredible does battle with young Violette's adolescence, Dash's math homework, and baby Jack Jack's emerging powers. Brad Bird once again brings it. What made the first film so amazing (and what made Bird a fan favourite to do Fantastic Four someday) is he perfectly nails the family dynamics in a family of superheroes. The action scenes are bigger and bolder than the first film. And the characters in new and brilliant ways. And Michael Giacchino once again knocks it out of the park with his music. But, of course, I have a quibble. Just about every animated film I've seen lately has the big twist of "trusted friend and ally being the REAL villain," and I'm getting pretty darn tired of it. Even Incredibles 2 falls back on that, so it was mildly annoying. 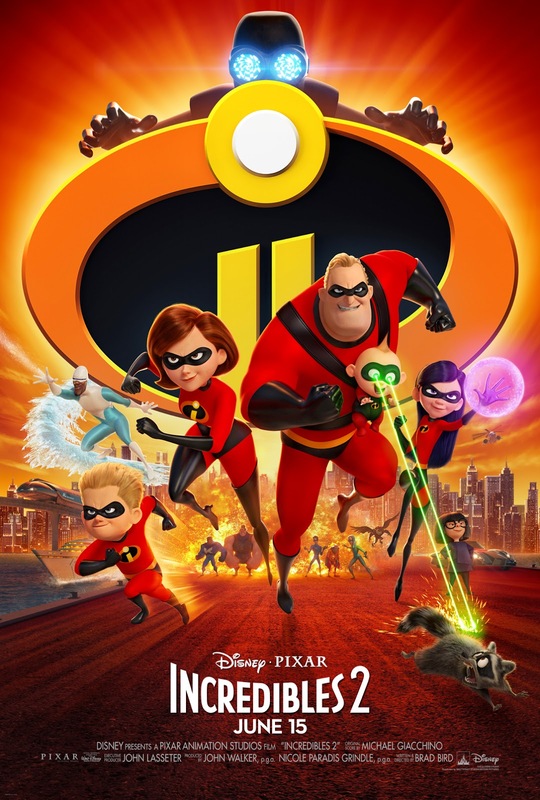 In the end, Incredibles 2 is a very worthy sequel that's just as good as the first film. Highly recommended. 3.5 Nibs. Full review on the website. And then, a few short days after the Canada Day weekend, comes that other momentous July holiday...my birthday! I celebrated in the traditional manner...dinner and a movie with my folks, because I'm cool like that. And I knew exactly what I wanted for dinner. Bubba Gump Shrimp Co. is now open in West Edmonton Mall. Ah, Bubba Gump Shrimp Co. A delightful throwback to the 1990s, and the heyday of gigantic theme chain restaurants like The Hard Rock Cafe and Planet Hollywood. They all kind of imploded in the early 2000s, but Bubba Gump Shrimp survived. The restaurant is themed around the film Forrest Gump, and since Forrest Gump made his millions running a shrimp boat and having a shrimp company, about 90% of their menu is shrimp. And, needless to say, because they've only been open for about a week, it's busy AF in there right now. I hit the mall at around 4PM and started chatting with the hostess. Here's how it works, when you're venturing to Bubba Gump. Go talk to one of the hostesses standing around outside. They'll put your name on the list and get your phone number. When your table is ready, they text you. I figured I may as well put my name on the list right away, rather than wait for my parents to show up. So I did, and the hostess told me it would be about an hour and fifteen minutes. Perfect! We wanted to eat around 5 anyway. So then I started hanging out at the Mall. Then my parents showed up. Then I started hanging out at the Mall with my parents. Because I'm 41 and cool like that. We wandered around, Mom and Dad caught me up on the family gossip, and before you knew it, my phone beeped and it said our table was ready. We went back to Bubba Gump, I showed them the text, and then they told us to go stand in line inside the restaurant! But, to be fair, once your reach this stage, the line moves pretty quick. Chatted with the inside hostess for a bit, where we shared our knowledge of Forrest Gump, and I let her vent a bit about the people who didn't know the system and tried to cut in line and would cuss out the hostesses. Calm down, people! Enough shrimp for everyone. We got to our table, and it's in the bar section. Which is cool. We're all adults. As is to be expected, the walls are covered with stills and promotional pictures from the film. Above the bar, there were three TV screens: one showing the World Cup, one showing that night's CFL game, and the third, of course, showing Forrest Gump. Our very friendly waitress soon came by to take our orders. But I didn't need to see a menu. I've been studying the menu online ever since the Edmonton Bubba Gump was announced back in December. I immediately blurted out, "Shrimper's Heaven!" Four kinds of shrimp: grilled, fried, tempura, and coconut. Served in four overflowing cones, and with three dipping sauces. And oh, it was so good. The grilled shrimp was OK. It had kind of a generic chain restaurant BBQ sauce flavour. The coconut shrimp was nice and crispy. The tempura shrimp was the biggest of them all. I tell ya, man, it was a heck of a lot of shrimp, but I managed to get it all down. For my drink, I had this mango peach slushie concoction which was very sweet. And because I mentioned it was my birthday, I got a free cupcake. In the end, I quite enjoyed my trip to Bubba Gump Shrimp. I'll probably go again...in about six months, once the crowds have died down a bit. And then it was time for the movie. For the annual tradition of my birthday movie, this year, I had chosen Jurassic World: Fallen Kingdom. To me, it made perfect sense. I always loved those dinosaur movies, and for my birthday movie 25 years ago, I saw the first Jurassic Park. It's a few years after Jurassic World. Claire, the former manager of Jurassic World, now heads up a charity dedicated to preserving the dinosaurs and letting them live in peace. But, it looks like the dinosaurs are going to die out all over again, as the volcano on the island has begun to erupt, and will soon destroy the entire island. Claire is soon approached by Eli Mills, who represents John Lockwood, John Hammond's original partner and one of the original investors in Jurassic Park. They want to save the dinosaurs and re-locate them to another island. And, they need Claire's help to re-activate all the old tracking implants in those dinosaurs so they'll be easier to track down. They also want Blue, the last surviving velociraptor, for Reasons, so Claire also recruits former raptor wranglers Owen. And they return to Jurassic World...only to be promptly betrayed my Mills' men. Turns out he wants the dinosaurs for his own sinister plans. What are those plans? And will Claire and Owen be able to stop him? This is probably the most horror-oriented of the Jurassic films, as there are a heck of a lot of jump scares. There's some surprising emotion, as well, as we're forced to watch the extinction of the dinosaurs all over again. 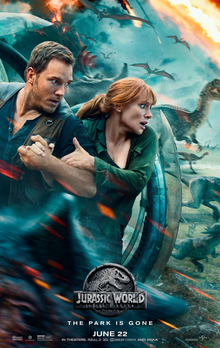 Claire and Owen, again played by Bryce Dallas Howard and Chris Pratt, are again some very likable heroes, and they work well together. And if that ending is to be believed, looks like the next film will finally be the "dinosaurs rampaging on the mainland" that we've been promised ever since the T-Rex got loose in downtown San Diego in The Lost World. So, yeah. Jurassic World: Fallen Kingdom was fun, and for me at least, the novelty of the dinosaurs hasn't worn off yet. I give it 3 Nibs. Full review on the website. And that was about it with my latest big city adventures. Not much more to add. Just, as always, thank you to my parents for the lovely time.